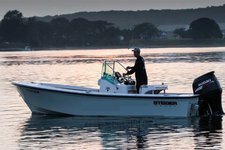 Captain Mike is a Connecticut native who has been fishing the waters of New England his entire life. Captain Mike’s angling pursuits have also taken him across the country and internationally, fishing in fresh and saltwater for everything from largemouth bass to giant bluefin tuna. In addition to being an accomplished captain, he is an avid surfcaster and feels right at home plying rocky shorelines in a wetsuit. Captain Mike is an innovative angler, constantly applying new techniques to up his fishing game, and his enthusiasm and passion for the sport are contagious. Captain Mike is a United States Coast Guard OUPV Licensed Captain and graduated from Southern Connecticut State University with Bachelors’ and Masters’ Degree in Education.